I’ve been wearing the same pair of running shoes for almost a year now, and they are ready for the bin. I’ve also used some subs that have seen some very light action, but the bulk of my work has been done by this other pair. I’m stepping up my training as my main goal of the year approaches in April, and as the aches and pains also turn up right on time I’m reminded to start shopping. Wear on the outsole – When there is noticeable wear on the outsole of your shoe it’s definitely time to think about a new pair. Look at the outside of the heel area, and the tread on the middle of the sole. If there is significantly less tread than there should be here, that’s a huge signal. Ride comfort – Has the cushioning gone? Do you get a response from the shoe as your foot hits the ground? Running shoes are designed to contain an invisible layer of support and cushioning throughout, from heel right through to toe in many cases. This layer is designed to take a certain amount of direct pressure but after a specific point it stops working. Make sure your ride is still comfortable. Shiny new shoes, who can resist?! 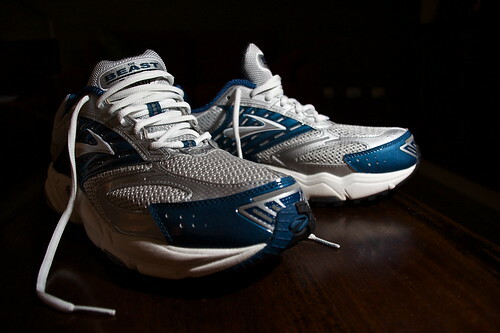 Mileage – 350 – 400 miles covered in any one pair of shoes is the point you should think about changing. Some prefer to change earlier or later, but, as a marker, this seems to work for me. Purchase date – Did you buy a pair of your favourite brand or style in the sales, put them away for three years and then decide to get them out and wear for training? The glue and fixing agents used in the manufacture of a shoe also wear out after a while, so the shoe you purchased may not be structurally sound after being stored for a long period. We all know that the wrong type of footwear causes injury, but shoes that have simply ‘worn out’ are just as dangerous to runners. And when I say ‘worn out’, I am talking about the internal support mechanisms and cushioning of the shoe as much as the bits that you can see. None of us wants to have to spend a fortune on new shoes all that often, but better this than getting injured for the sake of shopping. Ian Mountford has been a runner for over 20 years, and uses the pool and his bike for a bit of ‘competitive crosstraining’ every now and again. He’s also on Twitter and blogs about his sport here.